Published January 17, 2018 By Anna T. This post may contain affiliate links. Regardless, I only recommend sites I've researched and/or used and trust. The world wide web is basically overflowing with information. There are all sorts of sites where one can look up answers to just about any question imaginable. But sometimes people want a personal touch. They're looking for someone with real life experience who can provide more detailed answers, or personalized feedback regarding some particular problem. Consequently, several sites have cropped up where consumers with tough questions can seek out person to person interactions with experts in different fields. Most of these sites hire work from home freelancers to fill these positions, which means they’re potentially a lucrative new source of employment opportunities for those who have the right types of skills. Below, we’ve compiled several of these sites, and provided some basic information about each, so you can decide which ones might be a good fit for your abilities. This site lets people consult with an expert either by phone or through online chat. They match incoming questions to the best expert who's currently available so that people can get their answers within minutes. Customers are able to ask as many questions as necessary to get the answer they're looking for, and are allowed to seek a second opinion if needed. The company hires experts in more than 75 different fields, including subjects as diverse as computer hardware, medicine, and relationship coaching. You can work whenever you want, and there's no minimum or maximum required number of hours. If you apply, you'll have to prove your qualifications by providing diplomas, state licenses and things of that nature. This site focuses on phone-based interaction. Customers choose an expert that fits their needs, and use the website's interface to schedule a phone call, providing an estimated approximate call length based on the problem they're dealing with, and giving three potential times and dates when they'll be easy to get in touch with. At that point they are charged based on the suggested length of the potential call, and the expert’s per-minute rate. Once the order is complete, the selected expert has 72 hours to accept one of the scheduled times. If he or she doesn't, then the customer is automatically given a refund. Experts are graded in a variety of different categories based mostly on performance and availability. Those who rank higher are given better placement in the site’s search results. To apply, you need to provide them with a LinkedIn profile or a professional Facebook page so they can investigate your qualifications. Go here to learn more about Clarity. This is a site where you can sign up to help people with tricky homework questions. Customers list the question they're having trouble with, and provide a rough range of prices they're willing to pay. Experts are then able to bid, and the customer can pick which expert they want to hire based on a variety of factors, including customer reviews, qualifications, and price. To get hired here, you'll either need a degree in higher education, or you'll need to be a student currently attending college. You can check out our full Study Pool review to learn more, or check out their website here. This site has a slightly broader range of employment opportunities than most of the other businesses on this list. Here, your job might consist of answering simple written questions, and providing phone consultations, or it could be much more involved. For instance, you could get hired in a semi-permanent capacity as part of a larger project for some big company. It just depends on the level of skill you bring to the table, and the availability of work in your field of expertise. Maven’s software matches available experts with clients automatically, but apparently it's not the sort of job where you'll be sitting at your computer constantly waiting for the next customer. From the description it definitely sounds like this is mostly a part time position unless you land a juicy long-term contract as a paid consultant. Go here to learn more about Maven. This is another company that focuses on phone consultations, but they have a very different emphasis. Most calls to 6ya are apparently related to technical issues with various products, and they particularly need experts who are able to provide either telephone-based tech support, or mechanical expertise. According to their site, most calls last about 6 minutes, and you'll be paid for every single call you handle. You do the work through a smartphone app which lets you know when a call request is available. You can take whichever calls you want, and set your own schedule. There are many categories available, including subjects such as audio equipment, plumbing, sewing, and computers. Go here to learn more about 6ya. This is another site where customers browse a list of experts and set up a scheduled phone call. Ranking high in their search results appears to be based on a rating system. To get a higher ranking (which means more business), they suggest you take special care to fill out your profile with as many details as you can come up with. Customers want experts with the best qualifications, so modesty apparently doesn't pay off. It's also important to provide timely service to customers since their search algorithm uses response time as one of the factors when determining rank. Go here to check out OnFrontiers. This is a site where you can work as a tutor through a chat interface. Unlike the homework site mentioned above, Yup tutors aren't allowed to offer answers directly. Instead, they work with students to help them come up with answers on their own. The company’s rules in this regard are pretty strict, and it's clear that they're focusing this site on parents who want to offer their children a way of getting homework help, but don’t want to worry about the kids using the service to cheat. Yup only offers tutoring in three subjects—math, chemistry, and physics. To apply, you'll need to have suitable qualifications in your subject of choice, and pass a difficult test. Go here to visit Yup Tutoring and sign up. This site has a slightly looser approach to everything. Here you can provide any sort of consultation you might want. They have the philosophy that everyone is an expert on some subject or other, so why not sell that expertise? Are you good with Photoshop? Great. Sign up on Ether, and you can get paid to give people photo editing help. Do you know a lot about business strategy? If so, you could set yourself up as a business strategy phone consultant. Do you have a lot of relationship experience? Become a telephone counseler, helping people out with their romantic problems. Basically, on Ether the sky's the limit. To start working, you set your rate, and perform a procedure to have calls forwarded to your real phone number. You'll only get calls from customers who’ve already pre-paid your per-minute rate, and you can set things up so you only get calls when you're interested in getting them. Go here to learn more about Ether and sign up. This is another site where you can make money tutoring people. To sign up you'll need considerable training in your chosen field, and you'll have to pass a difficult exam. They offer tutoring in a much wider variety of subjects than Yup.com. You communicate with students via an advanced virtual classroom with a white board, and built in chat functions. You can also use voice chat during your sessions, which should make it much easier to get your point across. You can check out our full Tutor.com review to learn more, or visit the Tutor.com site here. This site focuses on providing advice. If you look carefully, you'll find quite a few different categories available, but there's clearly a focus on things like family and relationship coaching, as well as various forms of personal counseling. You can set your own rate, and handle your consultations through either phone calls or the built in chat interface. You can check out Ingenio here. This is a site where you can become a teacher and offer classes on just about any topic imaginable. They apparently have a very simple format for creating classes, along with online tools that make the process easier. One cool thing about this site is that there's not a whole lot of vetting. You don't have to bring any flashy qualifications to teach a class. If you've got enough practical experience to put together a decent course, you can offer it, and they'll let consumers decide whether or not what your offering is worth any money. You can sign up to be a teacher on Skillshare here. What makes this approach to money-making interesting is that there are so many variations on it, and quite a few of them are pretty easy to get started with. Some of these jobs can also be very, very lucrative. There are people in certain high demand industries making hundreds of dollars an hour for their consulting services, and in many cases all they're doing is sitting at home on the phone, answering questions that are easy for them because of their prior expertise. 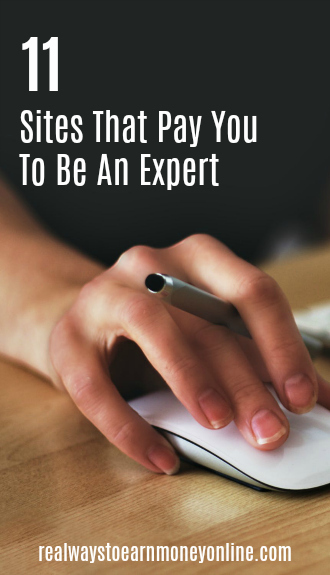 If you know of any other sites where you can sell your expertise that weren't mentioned here, or if you have personal experience with any of the sites listed above, let us know in the comments section, and tell us how they work. My e-book, How To Find REAL Work From Home Jobs, contains 150 legit companies, specific instructions on finding work at home jobs yourself, and also many, many resources you can trust for searching/following. Thanks a lot for the invaluable info. I have tried Studypool and Yup. The studypool test is pretty simple. It only requires you to prove that you can write a good grammar essay. It has lots of jobs but bidding is very competitive so as a new tutor you have to set really low bid prices to win a bid. Due to this, I found their site somewhat overrated in terms of the ease by which you get jobs. Yup on the other hand has a very tough test, extremely tough. I got a 52% when I needed to get a 70% to pass. You can, however, retake the test after 3 months. Eagerly waiting for 3 months. LOL. Thanks anyway for this article. Really helpful. You might also consider adding Chegg and Course Hero. They’re also nice tutoring sites.